‘Writing about yourself is a funny business…But in a project like this, the writer has made one promise, to show the reader his mind. In these pages, I’ve tried to do this.’ -Bruce Springsteen, from the pages of Born to Run In 2009, Bruce Springsteen and the E Street Band performed at the Super Bowl’s halftime show. The experience was so exhilarating that Bruce decided to write about it. That’s how this extraordinary autobiography began. Over the past seven years, Bruce Springsteen has privately devoted himself to writing the story of his life, bringing to these pages the same honesty, humour and originality found in his songs. He describes growing up Catholic in Freehold, New Jersey, amid the poetry, danger and darkness that fuelled his imagination, leading up to the moment he refers to as ‘The Big Bang’: seeing Elvis Presley’s debut on The Ed Sullivan Show. He vividly recounts his relentless drive to become a musician, his early days as a bar band king in Asbury Park, and the rise of the E Street Band. With disarming candour, he also tells for the first time the story of the personal struggles that inspired his best work, and shows us why the song ‘Born to Run’ reveals more than we previously realized. 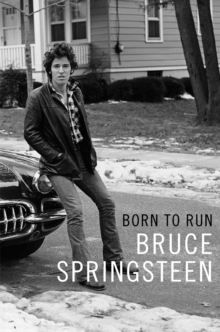 Born to Run will be revelatory for anyone who has ever enjoyed Bruce Springsteen, but this book is much more than a legendary rock star’s memoir. This is a book for workers and dreamers, parents and children, lovers and loners, artists, freaks or anyone who has ever wanted to be baptized in the holy river of rock and roll. Rarely has a performer told his own story with such force and sweep. Like many of his songs (‘Thunder Road’, ‘Badlands’, ‘Darkness on the Edge of Town’, ‘The River’, ‘Born in the U.S.A.’, ‘The Rising’, and ‘The Ghost of Tom Joad’, to name just a few), Bruce Springsteen’s autobiography is written with the lyricism of a singular songwriter and the wisdom of a man who has thought deeply about his experiences.